This algorithm represents the power of geometrically based membrane simulations. It was introduced by the diploma thesis of Sebastian Schneider (the text here is also based on his description). 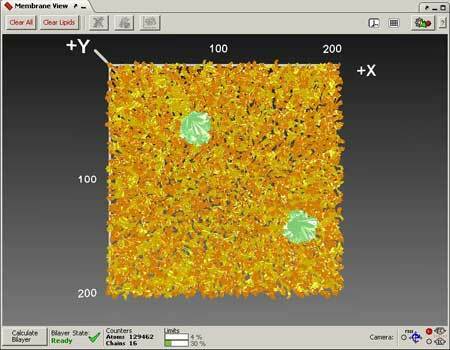 The main idea is the simulation of a cooling down or heating up process. The results are a more ordered or a more chaotic state. In both cases, the spatial optimization of the lipids is intended. The workflow of the algorithm follows a cooling plan. For the purpose of increasing the dynamics, the global state is computed after the position change of every single lipid. For this reason the expenditure of time is reduced, because the local energetic function has to be computed only once. The analysis of the random function for acceptance of less optimal states has to be computed more often, therefore the costs for restoring the former state after rejecting the computed change are reduced. In addition, the temperature is reduced linearly. This facilitates the prediction of the final state. The computation of the position is done randomly. Depending on the former position, the lipid gets a new position. The difference between the old and new position may not exceed 1 Angstrom. The global optimum computed by the Simulated Annealing algorithm is defined by the free space of the membrane. So it is a geometrical approach, which attempts to simulate the tendency of the membrane to build a bilayer without gaps. The energetic function calculates the medial distance between the newly-positioned lipid and the molecules in a defined cutoff. Thus, comparisons of the density of the membrane are possible. The algorithm offers a lot of options, which effect the simulation and allow the analyses of different membrane states. There is the possibility to calculate mono- or bilayer membranes. Choosing monolayer, it is possible to calculate only the extra- or intra-cellular membrane. The initial state can be chaotic or ordered one. Choosing the advanced option, the chaotic state is chosen. The quality of the placement can be improved by using the slider. In addition there is an option to divide the membrane into different pieces. Depending on this number, the membrane pieces are filled with lipids. Thereby the chance of finding a place nearby another molecule for each lipid is increased. Also the parameters of the cooling plan can be adjusted. The standard settings effect all settings. If those settings should be changed, this could be done for the temperature and the plateau settings. In contrast to the conventional procedure, which is the cooling down situation, it is also possible to heat the system. In this way, an ordered state can be transformed into a chaotic state. Of course in this case an ordered initial state is needed. But still the spatial optimization is the intention of this algorithm, although the aberration increases with the rise of temperature. Cooling down the system, chaotical states are converted into states of a higher order. Here, vice versa, a chaotic initial state is needed. 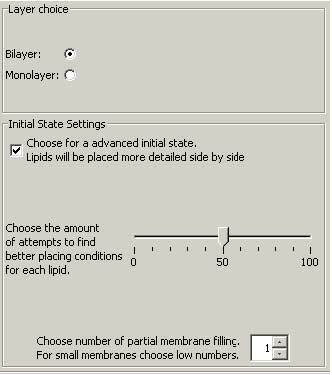 Using the properties, the different phases and phase transitions can be simulated according to the arrangement of the lipids. The end and start temperatures can be defined as well as the cooling rate. 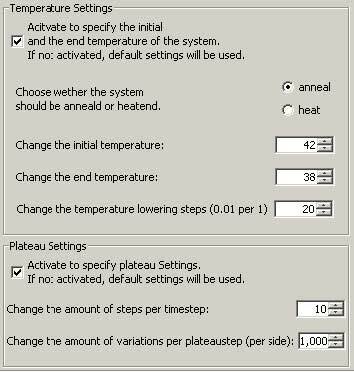 In the bottom part of the settings the number of plateau steps can be adjusted. The number of steps for each change of temperature can be defined as well as the number of repositionings for each change of temperature. For the purpose of reducing the computational effort, a cutoff can be defined. This means, at which distance, measured in Angstrom, lipids in the neighbourhood are involved in the computation. The Simulated Annealing Algorithm uses a special random generator, which computes in dependence to a starting number, called seed, to all other numbers. Using one seed for different simulations, the calculated random numbers match one of the other simulations. This is a requirement for reproducing the results of those simulations. A change of the seed or other properties will change the results of the simulation. For verifying the results, the seed can be changed, while the other parameters stay the same. The final states of the computed membranes should be similar to each other, while the concrete positions of the lipids should differ. Is this not the case, this could be evidence that the first results has only been a local optimum and the properties concerning the temperature, plateau-steps or the cooling rate have to be adjusted. The optimization of the positions of every single lipids leads to the minimization of space needed by that lipid. Therefore it may so happen, that the complete size of a membrane is not needed anymore, even though the number of lipids is constant. But if new lipids should be added, this can be defined as well. 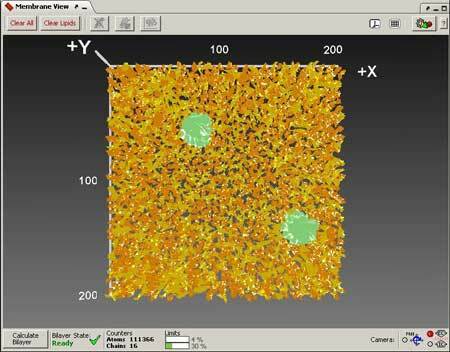 Also the number of lipids after a simulation may increase and could be used for further analysis. In addition, a physical pressure affecting the lipids can be activated. Forces from all sides of the membrane will manipulate the lipids. Also the proteins can get additional forces, which simulate the effect of these molecules onto the membrane. This is of importance in certain protein-lipid constellations like rafts. The chaotic initial state, whereby the postion optimization ihas been activated. A lot of gaps can be seen. The counter shows 111366 atoms. In this initial state, two proteins and ca. 2000 lipids are in the membrane. Now the calculation begins and ends regularly, if the end criteria, normally the end temperature, is reached. At the end of the simulation there are ca. 2500 lipids in the membrane. The space between those lipids have decreased. The results depend on the properties. 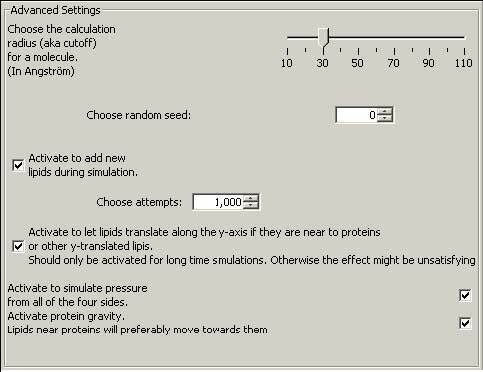 The probability for closing all gaps and for integrating the maximum number of lipids depends on the duration of the simulation. The result shown here is reached after a cooling down process of 4 degree in 0,2 degree steps.